Q: What made you to become an artist? Was that like a dream profession or it just came spontaneously? A: It came up spontaneously. I thought it would be a temporary job. I've always been interested in art, since a little kid I've always been drawing but becoming tattoo artist never crossed my mind. My first 4 or 5 tattoos were for friends and they were awful lol Couple of months later tattoo came back to me and knocked on my door :) it was the owner of a tattoo shop who's seen one of my friends tattoo and offered me a job. I didn't know anything about professional tattoo but I was excited about it and I wanted to have a new experience in my life. Q: How long have you been tattooing? Do you remember your starts? How was the first experience doing a tattoo on someone's skin? A: I made my first tattoo when I was about 18,19 years old. 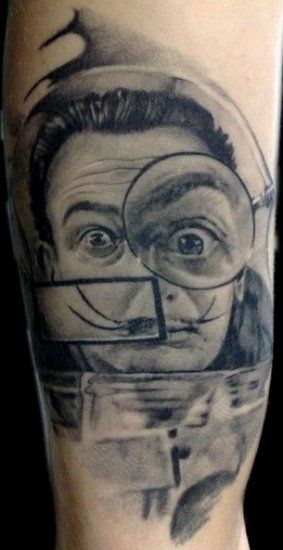 I did it just for curiosity- how does it feel to tattoo somebody. I was so curious but on the other hand I was scared! I couldn’t refuse that person even though he knew it was my first attempt so I think it was an interesting experience for both of us! I’ve been tattooing in studios for 10 years now. After first 6 months I wanted to quit because I felt like I'm not improving at all. I was visiting another tattoo shops to look for some inspiration and knowledge but I didn't get much help as back then in 2003 other artists in Poland didn't want to share their "secrets". When I was about to quit and was doing my last tattoo surprisingly I was quite happy with the result and that motivated me to continue my adventure with tattooing. But I had to learn everything by myself till I moved to Ireland. Actually I've learnt how to tattoo in Ireland so only from 2006 you can say I'm a professional tattoo artist but everyday I’m still learning new things. 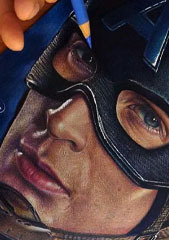 Q: I can see lots of custom works. 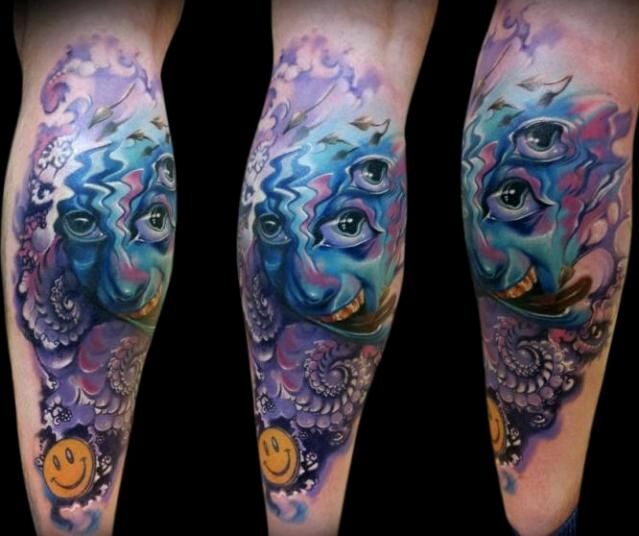 Colorful bright designs, fantasy mix with some realistic note in almost every tattoo. Can you tell me about the making process? A: If I have to copy a design I only look at it once at the beginning and then I add my vision to it so the result is what you can see… But to achieve that the client must be open for changes. If I get just a theme from a client I design it before or draw it directly on the skin- the example is “Mushroom hallucination” tattoo I did for my friend. If the client is somebody I know I'll try to customize the tattoo to the personality and character of that person. Q: Nowadays, there are a lot of tattoo styles. How would you describe your style? 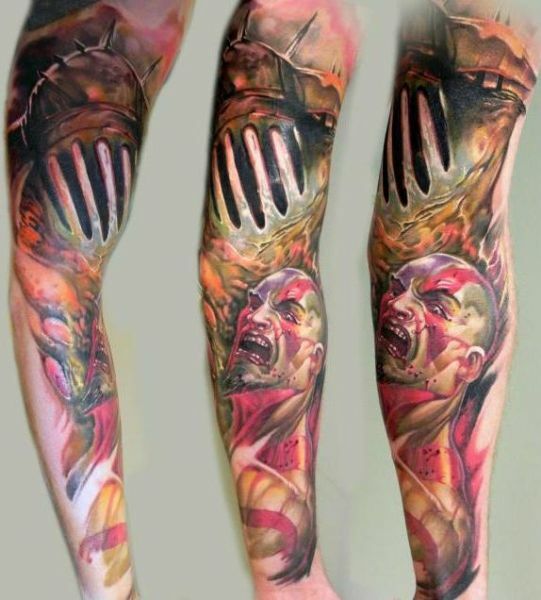 Q: I was amazed when I first saw the horror sleeve! Phenomenal work. Was it your idea? A: Thanks! I try to be flexible and do what people want, this is my job- but there’s one condition – the client’s idea must make sense and I have to be sure that it will look good on the skin. I wouldn’t do anything which I know will look bad. 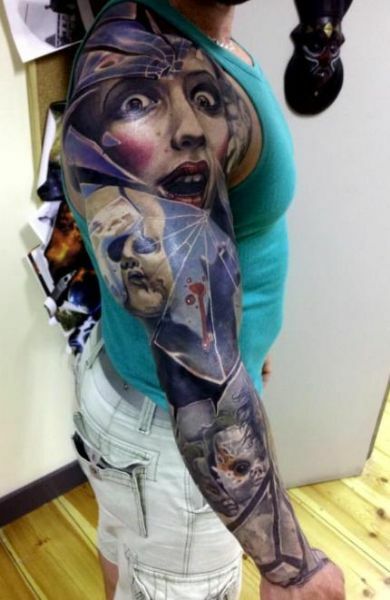 The theme of “Horror sleeve” was given to me by client, he also had some inspiration photos of what he wanted. 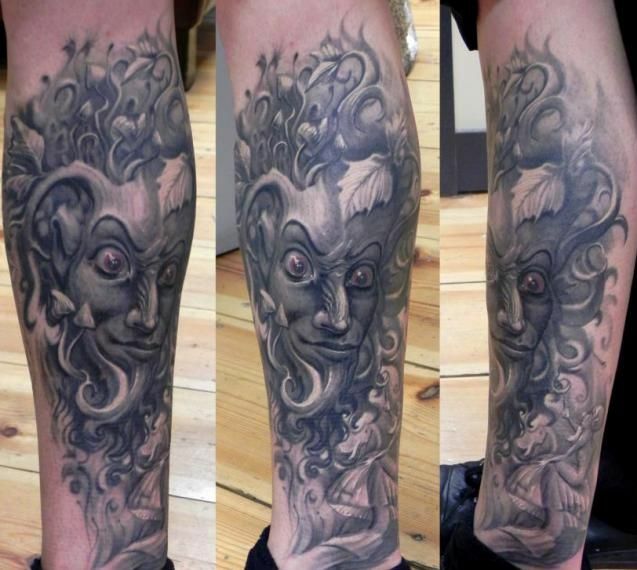 The whole tattoo was collage design. Paddy gave me full freedom in doing that tattoo, it was important that we will both be happy from the result. Q: Do you avoid ready-made designs to tattoo? Q: What kind of tattoos people like the most? A: I don’t know about other places but in my shop most popular are religious themes, compasses, ancient clocks… Boring, repeated themes… Skulls and roses will always be popular I think. Q: Tattooing is like a giving an eternal impact on someone’s life. 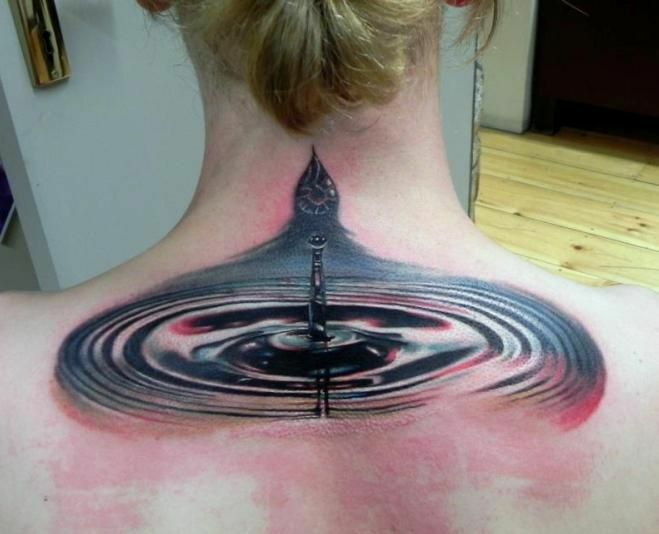 What reaction from a client makes you happy after finishing the tattoo? A: The biggest joy for me is when the client stands in front of a mirror, smile and after a while he/she’s back to get another tattoo of me! Then I’m sure he/she’s happy with the result and that makes me happy. When on top of that client gives me free hand and creative freedom in the second tattoo I’m delighted! Q: How do you get inspired? Do you have any influences, people you simply admire and push you forward in your work? A: Everything what is around me inspires me, interesting stories, my dreams, my life even the wooden floor in my shop was an inspiration for one of my free-hand tattoo (yellow face with red eyes and blue elements). If it comes to the people it started with Paul Booth cause I could see dark energy in his work. And not only see it I could almost feel it! Then Robert Hernandez, Nick Baxter… But there's so many good artists these days- Jeff Gogue, DmitriySamohin and many more.... I value people who create art rather than copy designs from catalogues. 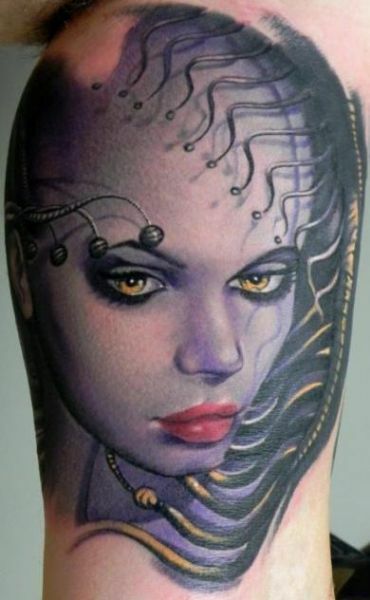 Q: Today, going on a tattoo convention could be very beneficial and cool experience for every tattoo artist. There are many new and creative people out there that are trying to bring the tattoo culture on a higher level. How often do you visit tattoo conventions? A: I didn’t attend many tattoo conventions, only few and in Ireland. 2,3 years ago I thought I didn’t have much to show in the world so I just didn’t go anywhere. I think it changed now and I’m planning to attend few conventions in Europe next year. Conventions and guest spots are very helpful when you want to grow- there’s many great artists working there and you can exchange opinions and experience. Q: Do you still feel the same enthusiasm after all those years of hard work? A: Yes, all the time! Recently I even feel more power to work. The enthusiasm is getting bigger with my grow. A: The hygiene of work, high manual skills, creativity, aiming to achieve all the plans we set for ourselves no matter that sometimes it’s not the way we want it... Also love and passion for tattooing!